He scored a massive hit with Bajrangi Bhaijaan last year, and the movie ended up as the second highest Indian grossed movie after Aamir Khan’s PK. He has been quite delighted for teaming up with Sooraj R Barjatiya for a family entertainer Prem Ratan Dhan Payo and the film ended up as a decent entertainer. ‘Dabangg’ Khan is currently shooting for his next movie titled Sultan, and the film is said to be an intense action thriller. Abbas Ali Zafar is directing the film and Anushka Sharma is the female lead. Salman has been spotted as a wrestler, and he has taken special care on his looks. Salman is working for over 6 hours on a regular basis to look like a fighter along with his shoot. The makers have recently revealed the first look teaser of the movie which created huge buzz and sensation. Salman pinned huge hopes on the film, and he has been working hard to wrap up the shoot on time. The movie’s shoot has been delayed several times because of Salman Khan, and the makers are now shooting with two different units to wrap up the shoot of Sultan on time. The movie has some high voltage action episodes, and Salman has been spotted in a wrestling look in the recent teaser which created a huge sensation. As per the latest news we hear, Sallu is currently in Delhi shooting for an important sequence in a hospital. 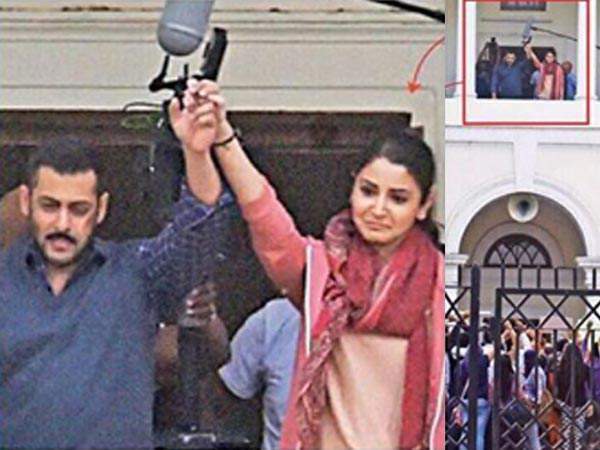 Salman Khan and Anushka Sharma shot for some intense and emotional episodes for the movie in a private hospital in New Delhi. He looks extremely emotional in the scene, and this Haryana Ka Sher gets admitted to a hospital. The episode shows huge crowds gathering outside the hospital enquiring about his how abouts. Salman and Anushka walk out of the hospital giving the signs that their Sher is extremely doing fine. The complete scene has been shot on Thursday and Friday in Delhi. The schedule also has some other crucial scenes after which the entire unit will move to Punjab and Haryana for the next schedule. Aditya Chopra is producing Sultan on Yash Raj Films banner, and the movie has been slated for Eid release this year. The theatrical Sultan official trailer of the film will be out in June this year.